TAMPA, Fla. -- The growing crisis in Iraq has put University of South Florida Professor Derek Harvey, a retired Army colonel who served as a chief advisor to Gen. David Petraeus, in the media spotlight as an expert commentator on the complex and dangerous situation. 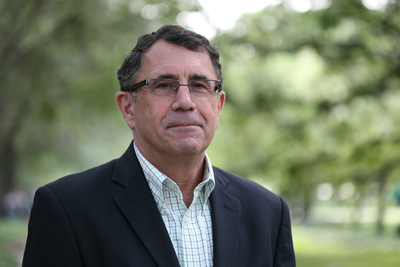 Harvey, a professor of practice and director of research and strategy at the College of Arts and Sciences’ Global Initiative for Civil Society and Conflict (formerly The Citizenship Initiative), comes to USF with more than 30 years experience in military intelligence and sociocultural analysis. Since Joining USF in 2013, he has helped lead the Global Initiative for Civil Society and Conflict, along with Professor David Jacobson, to bring together researchers from academia, the government, think-tanks, and NGOs to create new ways of understanding the role of conflict, civil society and identity. In recent weeks, Harvey has appeared on leading national and international networks to share his unique perspective on Iraq, which is being pushed toward civil war in a vicious assault against the government by an al-Qaida breakaway group. The Islamic State of Iraq and the Levant has seized a large section of northern Iraq with the goal of establishing an Islamic state on the border of Iraq and Syria. The crisis leaves the United States, which had withdrawn troops from Iraq, in a difficult position on whether to recommit U.S. forces to the country or allow it to fall under extremist influence. Journalists have turned to Harvey for insight. Below are a sample of interviews and links to articles featuring Harvey and the Global Initiative on Civil Society and Conflict. Since joining the Global Initiative for Civil Society and Conflict, Harvey has leveraged USF’s interdisciplinary resources to enhance USF’s national and international reputation. USF now is poised to become the leading public institution explaining trends in civil society and conflict and explaining sociocultural factors driving conflict in the Middle East, North Africa, Central Asia and Latin America. Harvey is a successful and internationally experienced intelligence practitioner and former U.S. Army Colonel who served as the Army senior fellow to the U.S. State Department, and is a graduate of the Harvard University John F. Kennedy School of Government, Intelligence & Policy Program. In 2008, while serving as a Defense Intelligence Agency senior leader, he was hand-picked by the CENTCOM Commander to build the Afghanistan-Pakistan Center (APC). He served as director of the APC from 2009-2012 and left the Defense Intelligence Agency in 2013.